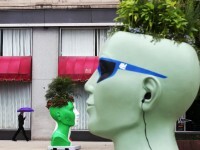 A head planter is painted with earphones and sunglasses. Each planter is sponsored by an area business on July 2, 2013. Fifteen large sculptural head planters are placed along Michigan Avenue as Chicago’s “Cultural Mile” from Chicago River south to Roosevelt Road.